al downing spent 7 years of his 17 year career in dodger blue. 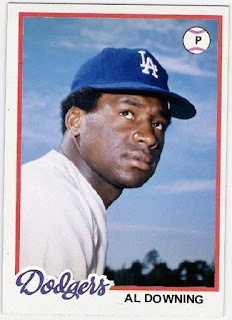 beginning in 1971, he won 46 games for the dodgers, finishing his career with 12 appearances in the 1977 season. he wound up with 123 wins and 1639 strikeouts. i mentioned recently that he lacked a proper 'final tribute' card - a 1978 topps (he doesn't have a 1977 topps card either, for that matter). 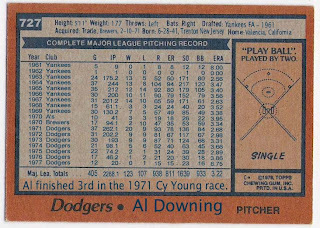 that all seems wrong, so here is my rendition of a 1978 topps al downing. the card would fit right in with the high number of spring training shots the dodgers have in their 1978 set, although the picture is of a younger downing, probably circa 1974 or so. still, topps has been known to re-use photo sessions. i should note that all of these final tribute cards i have created should have a back with the final career stats (that's the whole point of a final tribute in my mind) but i just don't have that much time or patience. i did make an exception with downing since it's a 1978 card. i did print one out and sent a note explaining the card and asking him to sign it so i could add it to the modest 1978 topps dodgers autograph project, but he returned it unsigned with a note that he was not a member of the 1978 team. still, i think it's a nice looking card that al downing deserved to have made. The note he sent sounds pretty wild. Really interesting that he declined to sign it b/c he wasn't on the '78 team. bill buckner through the mail success! jay johnstone through the mail success! tommy john ebay auto success! there's a play at the plate with mike piazza! hello larry! to both of you!